Your doctor removed your appendix either by making many small cuts, called incisions, in your belly (laparoscopic surgery) or through open surgery. In open surgery, the doctor makes one large incision. The incisions leave scars that usually fade over time. After your surgery, it is normal to feel weak and tired for several days after you return home. Your belly may be swollen and may be painful. If you had laparoscopic surgery, you may have pain in your shoulder for about 24 hours. You may also feel sick to your stomach and have diarrhea, constipation, gas, or a headache. This usually goes away in a few days. Your recovery time depends on the type of surgery you had. If you had laparoscopic surgery, you will probably be able to return to work or a normal routine 1 to 3 weeks after surgery. If you had an open surgery, it may take 2 to 4 weeks. 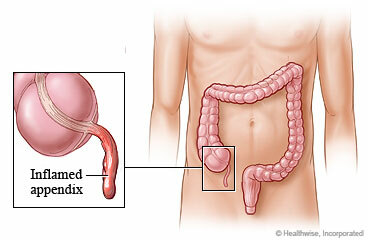 If your appendix ruptured, you may have a drain in your incision. Your body will work fine without an appendix. You will not have to make any changes in your diet or lifestyle. For about 2 weeks, avoid lifting anything that would make you strain. This may include a child, heavy grocery bags and milk containers, a heavy briefcase or backpack, cat litter or dog food bags, or a vacuum cleaner. You may be able to take showers (unless you have a drain near your incision) 24 to 48 hours after surgery. Pat the incision dry. Do not take a bath for the first 2 weeks, or until your doctor tells you it is okay. If you have a drain near your incision, follow your doctor's instructions. You may drive when you are no longer taking pain medicine and can quickly move your foot from the gas pedal to the brake. You must also be able to sit comfortably for a long period of time, even if you do not plan on going far. You might get caught in traffic. You will probably be able to go back to work in 1 to 3 weeks. If you had an open surgery, it may take 3 to 4 weeks. If your appendix ruptured, you will need to take antibiotics. Take them as directed. Do not stop taking them just because you feel better. You need to take the full course of antibiotics. Do not take two or more pain medicines at the same time unless the doctor told you to. Many pain medicines have acetaminophen, which is Tylenol. Too much Tylenol can be harmful. If you had an open surgery, you may have staples in your incision. The doctor will take these out in 7 to 10 days. You may wash the area with warm, soapy water 24 to 48 hours after your surgery, unless your doctor tells you not to. Pat the area dry. If your appendix ruptured, you may have an incision with packing in it. Change the packing as often as your doctor tells you to. Packing changes may hurt at first. Taking pain medicine about half an hour before you change the dressing can help. If your dressing sticks to your wound, try soaking it with warm water for about 10 minutes before you remove it. You can do this in the shower or by placing a wet face cloth over the dressing. Remove the old packing and flush the incision with water. Gently pat the top area dry. The size of the incision determines how much gauze you need to put inside. Fold the gauze over once, but do not wad it up so that it hurts. Put it in the wound carefully. You want to keep the sides of the wound from touching. A cotton swab may help you push the gauze in as needed. Put a gauze pad over the wound, and tape it down. You may notice greenish grey fluid seeping from your wound as you start to heal. This is normal. It is a sign that your wound is healing. Enter X801 in the search box to learn more about "Appendectomy: What to Expect at Home".